What is it? 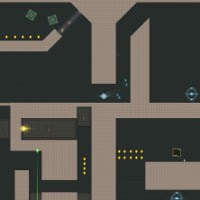 – Droids is a brutally challenging action puzzle game containing 20 trap and enemy-laden levels to navigate with your tiny robot. Who made it? – The game was developed by Egoshin Alexey, and programmed by Abramenko Alexey and Muraviev Dmitry. How does it play? – Droids is very similar to the game Evito Ball (by Kable Monck) in both concept and gameplay. Each level is presented from a top-down view, and requires you to “roll” your small circular droid to the exit. While navigating from the start to the exit, your droid will have to contend with mines, laser beams, force fields, enemy bots, turrets, and gravitational anomalies. Presentation – The game is visually sharp. Defeated enemies explode into tiny fragments that ricochet satisfyingly around the environment. All of the different types of obstacles and traps are also well represented, making it fairly easy to identify predicaments before you’re neck-deep in them. Positives – Despite the insane level of difficulty, I always felt compelled to continue (sometimes after a decent break). Many of the level designs are ingenious, blending the various pitfalls together in interesting ways. The sense of accomplishment that I got from completing a particularly troublesome stage was much greater than your average game. Negatives – You might need a fist-proof monitor to enjoy this game to the fullest. Many of the levels are tougher than petrified beef-jerky, and only steel-tempered perseverance will see you through to the end. Gamers in the more “casual” camp may abandon the title in exasperation. The game also lacks any story to speak of, but, given the game, it’s not a major complaint. Why you should play it – Droids is a title aimed squarely at serious gamers. It requires a significant amount of time to complete, and is perfect for action fans looking for some innovative platforming mixed with light puzzle-solving elements. If you’ve got the skills (and monk-like patience), it’s great fun.